This album takes me back to where I started sitting on a Vox AC30 amplifier listening to my uncle George's Merseybeat group "The Beatcats" releasing sometime between 1960 to 1963. I grew up steeped in 50's, then 60's popular music. My early memories are of Lonnie Donegan and Emile Ford and the Checkmates; on both occasions seen from the back of the Liverpool Empire with my parents. I didn't know then, that one day I'd meet Rory Storm and Shane Fenton (later Alvin Stardust) or play on the same guitar festival as one of my early guitar heroes - Joe Brown. I've had an interesting time working with material in many 'covers' bands. So I pay my respects to The Beatles, Free, Jethro Tull, Led Zepellin, all the Merseybeat groups, and the Rolling Stones. These groups, most noticeably the Beatles and the Stones, took black American music and brought artists such as Howlin Wolf, Little Richard and Bo Diddley to name a few, to a mass audience, on both side of the Atlantic. I take my cue from the British Beat Boom singing black American music like a Merseysider. Until huge popular demand means I can afford to pay a band, I'll have to play, write and sing everything myself (while trying to learn digital recording ) as on this album. I've tried to capture the excitement I felt playing all these wonderful songs for the first time around. 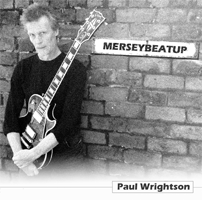 If I sound a little ragged around the edges these days, maybe I'm a little Merseybeatup.